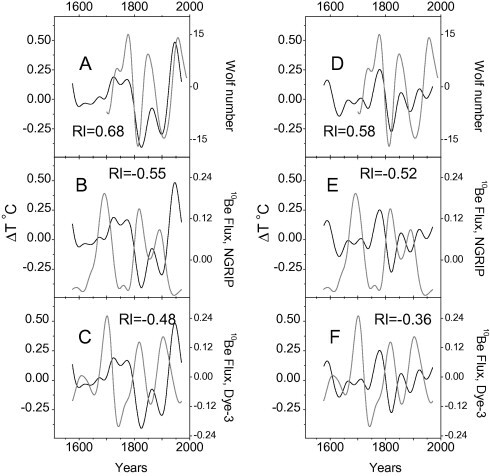 A new paper published in Advances in Space Research finds "evidence for a connection between century-long variations in solar activity and climate was obtained for the entire boreal zone of the Northern Hemisphere," correlated to the Gleissberg century-scale solar cycle. 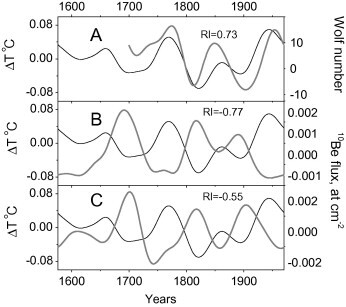 "A century-scale (60–140 year) cyclicity was found in the summer temperature reconstruction from the Taymir peninsula (∼72° N, ∼105° E) and other high-latitude (60–70° N) regions during the time interval AD 1576–1970. This periodicity is significant and consists of two oscillation modes, 60–70 year and 120–140 year variations. In the summer temperatures from the Yamal peninsula (∼70° N, ∼67° E) only a shorter-term (60–70 year) variation is present. A comparison of the secular variation in the Northern Hemisphere temperature proxies with the corresponding variations in sunspot numbers and the fluxes of cosmogenic 10Be in Greenland ice shows that a probable cause of this variability is the modulation of temperature by the century-scale solar cycle of Gleissberg. This is consistent with the results obtained previously for Northern Fennoscandia (67°–70° N, 19°–33° E)"
Time evolution of growing season temperatures in the Northern Hemisphere was analyzed using both wavelet and Fourier approaches. 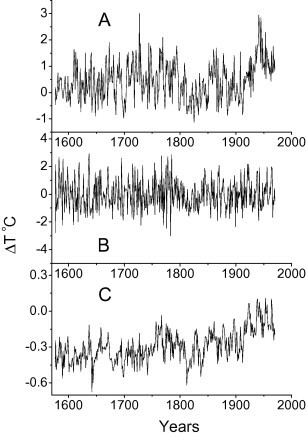 A century-scale (60–140 year) cyclicity was found in the summer temperature reconstruction from the Taymir peninsula (∼72° N, ∼105° E) and other high-latitude (60–70° N) regions during the time interval AD 1576–1970. This periodicity is significant and consists of two oscillation modes, 60–70 year and 120–140 year variations. In the summer temperatures from the Yamal peninsula (∼70° N, ∼67° E) only a shorter-term (60–70 year) variation is present. A comparison of the secular variation in the Northern Hemisphere temperature proxies with the corresponding variations in sunspot numbers and the fluxes of cosmogenic 10Be in Greenland ice shows that a probable cause of this variability is the modulation of temperature by the century-scale solar cycle of Gleissberg. This is consistent with the results obtained previously for Northern Fennoscandia (67°–70° N, 19°–33° E). 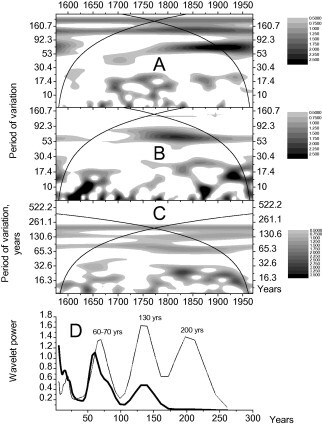 Thus, evidence for a connection between century-long variations in solar activity and climate was obtained for the entire boreal zone of the Northern Hemisphere.